This morning I set off a little later than I have previously - to see if the rain would ease off at all and was fortunate to have a short hour or so of heavy rain. Overnight I had received some free advice, from my sister and niece, that I should be wearing a cycle helmet on this trip and also told of some examples of where people had suffered from not doing so. Although I have a helmet in Kent, I had decided I could do without. 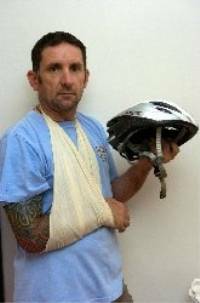 So it was a little to my surprise when, not ten hours later, Stewart Fairley approached me in Inverkeithing High Street and told me his story about how he believes his helmet saved his life a few weeks ago. I was so struck by this that I did say that I would buy a helmet at the next cycle store I passed by. 'That's great' said Stewart, 'as there is one not 200 yards down the road.' I am now the proud owner of a £30 helmet which I bought from that Sandy Wallace Cycles and very grateful to Stewart and others for getting me see some sense. Thank you. Crossing the Firth of Forth was always going to have to mention the bridges. These, despite the dull weather, looked elegant and dramatic. Cycle path - maximum speed 15 mph! - along the western side of the Forth road bridge; the bridge construction started in September 1958 and it opened in September 1964. It is 2,512m long and carries circa 32,000 vehicles daily (2004). The actual cycle route is presently only on the western side of the road bridge (thank you Stewart again) and after a short steep section affords good views up to the estuary to the west towards amongst other place Longannet coal fired power station. This was the largest coal fired station in Europe when it was fully operational and it began generating in 1970 and is now capable of co-firing biomass, natural gas and sludge. Its generating capacity of 2,400 megawatts is the highest of any power station in Scotland. and is now the third largest, after Bełchatów in Poland and Drax in England. The reason I have written about it is because ScottishPower, and others, are seeking to prove Carbon Capture and Storage technology at this site supported by the UK government by 2014. Looking the other way the Forth Bridge can be seen - still being painted! The Forth Bridge, opened on 4 March 1890, was until 1917, when the Quebec Bridge was completed, the longest cantilever bridge in the world; the Forth Bridge remains the second longest. The bridge was built in steel alone, the first bridge in Britain to use that material. It was the first major structure in Britain to be constructed of steel. Its contemporary, the Eiffel Tower was built of wrought iron. Construction started in 1883 and over 4,500 people were employed at the peak; over 450 workers were injured and 98 lost their lives. There is a great cycle route (NCN1) that goes into the heart of Edinburgh following along the coast. I followed this as far as the A902. From there I decided to follow the signed green 'RR' route which guides cyclists around the city to the eastwards exiting on the Biggar Road (A702). This route took me within a mile of Rosslyn Chapel that was a major feature in the last part of Dan Brown's 2003 novel The Da Vinci Code. Further up the road, I joined the upper tweed valley after Broughton just short of my final destination. I was very happy to arrive, somewhat cold, at 18.30. 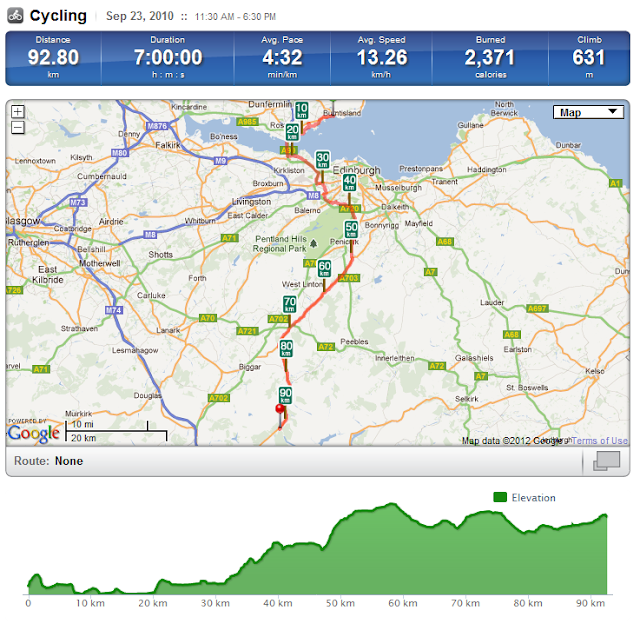 A fairly long ride for only 57 miles I feel. The Tweed valley upstream from Broughton. The temporary railway used in the construction of Megget and Talla dams can be seen in the foreground at the base of the A701 embankment. The helmet debate is a thorny one. I always wear one while cycling to work in London because the roads are busy and very unpredictable. When I'm out touring I usually take one with me for the busy stretches but take it off when I'm on quiet roads or cycle tracks.